In my new role, I get to work with a lot of new products and features that are not yet in a state to be used for beta, never mind being close to GA. This means, from time to time, that we needs to work around a few specific problems to get the product/feature to work. On this particular occasion, we were trying to add a custom firewall rule to an ESXi host. The rule took fine, but did not persist through reboots of the ESXi host, which is what was required. This is the solution we came up with. Please note that this method of changing the services.xml IS NOT supported (Jeez, I feel a bit like William Lam now :-). However, I didn’t figure out any other way of doing this during my research. If someone knows of a supported way, I’d love to hear.Anyways, let’s get on with adding the role. The first step is to change the /etc/vmware/firewall/service.xml so that it could be edited. Set the permissions back the way they were before the changes. You can also check if the module was loaded after a reboot by using the command bootOption -m.
Kudos once again to Paudie for his help with this. great post – I have not yet known the BootModuleConfig.sh script! However, if you add the file this way then it will probably get lost once you patch the ESXi host, because it is not part of the installed image profile. A safer way to permanently add a firewall rule is to create a VIB package of it and install that package. 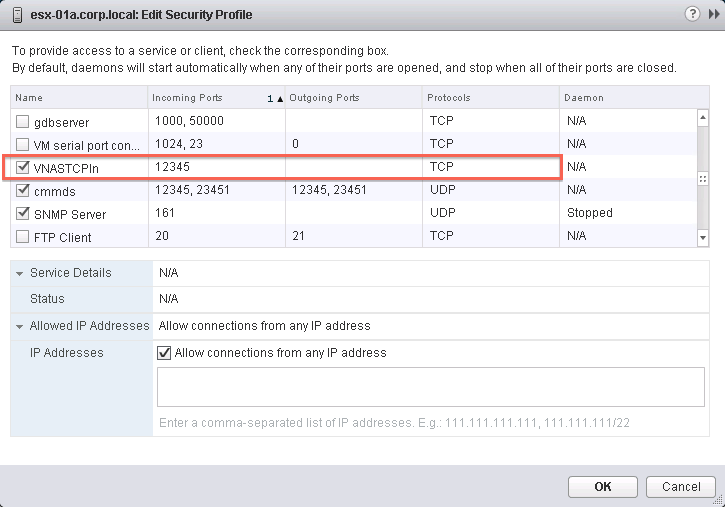 I have explained that process in this post: http://www.v-front.de/2012/01/howto-use-esxi-5-as-ntp-server-or-howto.html. Thanks Andreas – agree completely, and also the reason I called this out as “unsupported”. But it was a quick way to get me going at the time.